Have you seen the Straitline Silent Guide ? Curious to learn more? Details inside. 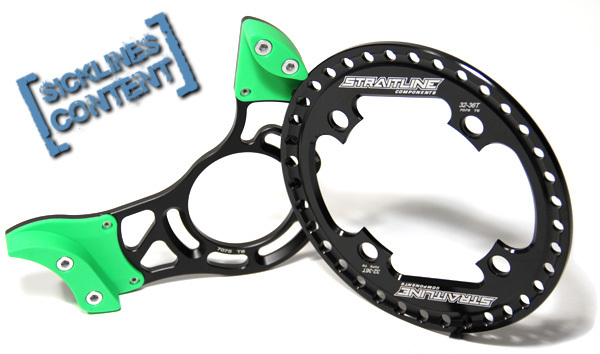 The Straitline Silent Guide is a bit different than today's typical chainguides. Most chainguides have a upper slider with a lower roller and some sort of plastic bashguard. Straitline has changed this up a bit drawing from how motocross bikes are designed. They went with a dual slider design that uses no moving parts. This keeps the chainguide simple and durable as well as keeps the weight down. They also decided to use an aluminum bashguard instead of plastic type bashguard. Straitline prides itself on machining and the bashguard is machined quite nicely out of strong 7075 T6 Aluminum in their Canada facility. They also bought an injection molding setup to make the sliders and other parts in house as well. While the decision to go with a metal bashguard is a bit uncommon these days it raises a few questions like the following. Will it be too strong for bashing into objects causing damage to other more expensive parts? Will it get hung up on rocks instead of gliding across them? So far it has held up well to a few hits without any adverse effects on our parts but it doesn't glance off rocks the same way polycarbonate bashguards seem to in our experience so far. Now that we've given you a bit of an introduction to the Silent Guide, lets check out its features in more detail. The Silent Guide comes in two sizes: 32-36T (pictured in this article) and 36-40t. 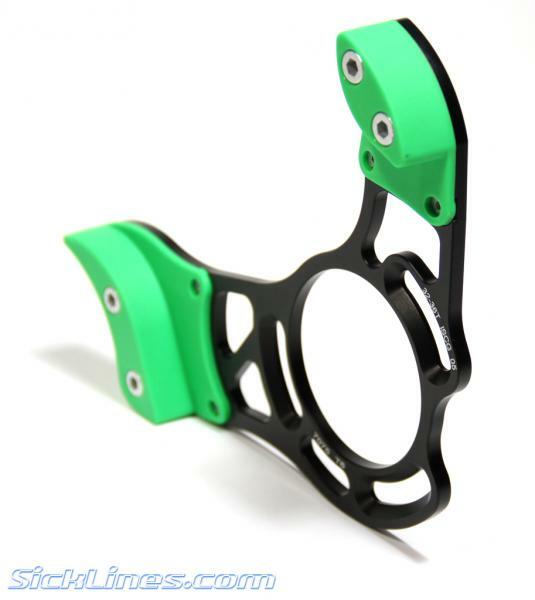 Both ISCG styles: There is a ISCG and ISCG ‘05 pattern to fit any bike ISCG mount. 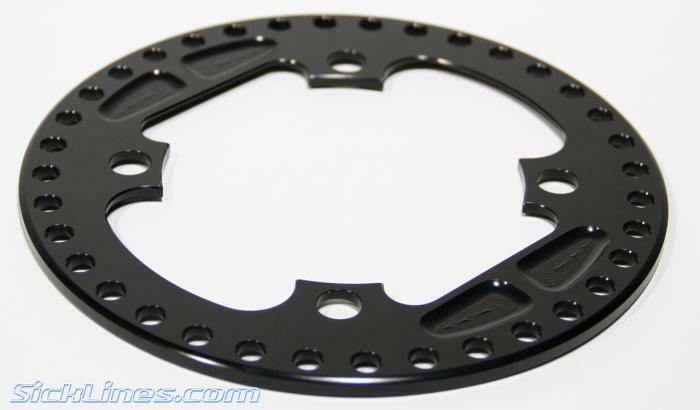 7075 T6 Aluminum construction: The backplate and bashguard are both machined to a stout 5mm thickness. 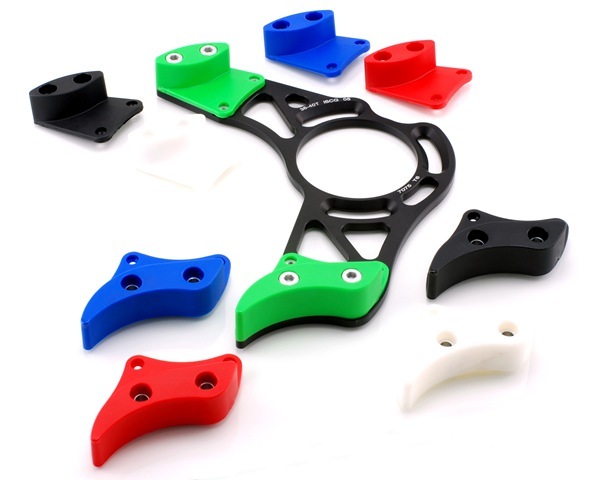 Each is made from machined 7075 T6 aluminum. 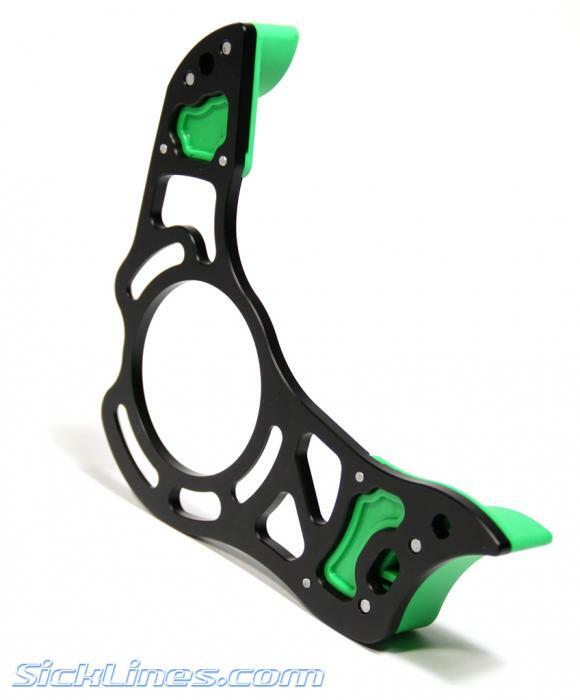 7075 T6 aluminum is a very strong material for the bashguard and backplate. According to Straitline it is 7 times stronger than Lexan and 2 times stronger than 6061 T6 aluminum that can be found on other bashguards. Durable polyurethane sliders: The sliders have been relatively durable and quiet. 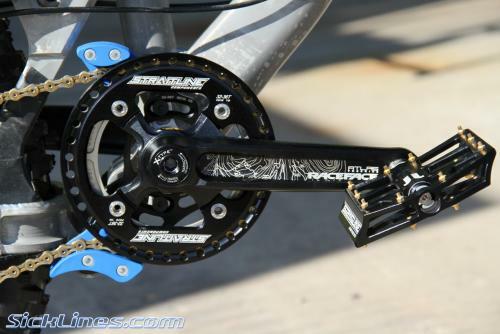 The chain simply glides across the sliders keeping tension and almost no noise when pedaling. 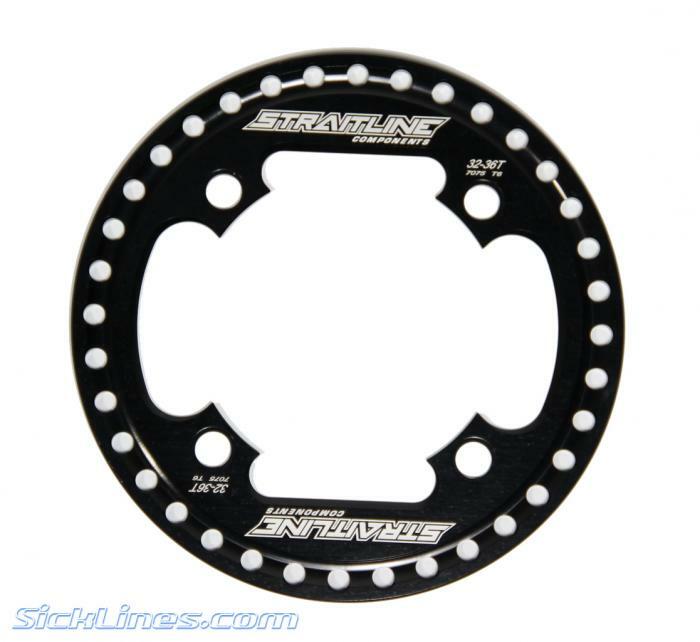 Straitline says that their sliders are chemical resistant and you shouldn't have to worry about your chain lube eating into the sliders or making them brittle over time. During usage, the lower roller will get a groove which Straitline says is normal. Replacement parts are readily available through QBP/BTI as well, so swapping out the sliders when they wear is not hard. Replaceable sliders: The sliders can be replaced on the Silent Guide very easily if they were to become damaged or you want to a different look on your build. The sliders are keyed to the backplate so they sit firmly in place. The lower slider has a little bit of give to it on the rear edge. Each guide comes with green but black, blue, white, or red sliders can be purchased separately. 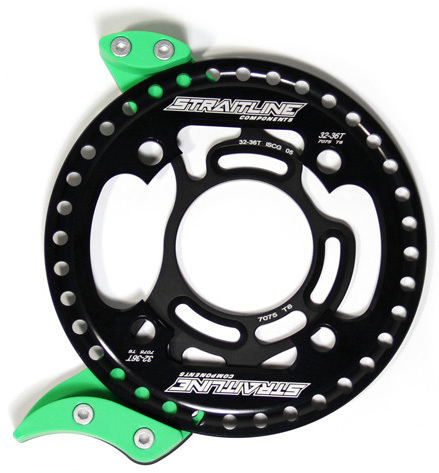 Straitline seems to be about simplicity to us, as all of their parts are generally pretty simple on the surface, but have good execution and performance to match. Since there are no moving parts or bearings, this guide follows their simplistic ideology and makes it essentially maintenance free. Riding in the mud or other adverse conditions can wreck havoc on a chainguide and Straitline thinks this guide will be able to take the proverbial cake by the end of the day. 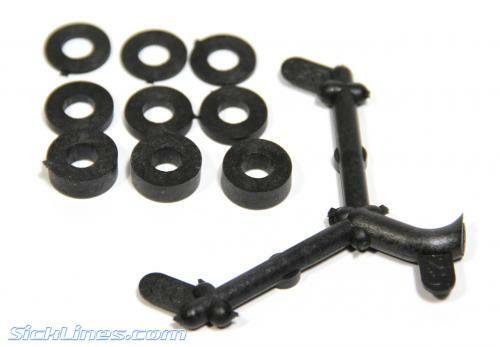 Easy adjustment parts included: The Silent Guide comes with 2 sets of chainguide bolts much like the other chainguide companies and comes with 3 sets of plastic spacers (1.25mm, 2.5mm, and 5mm). 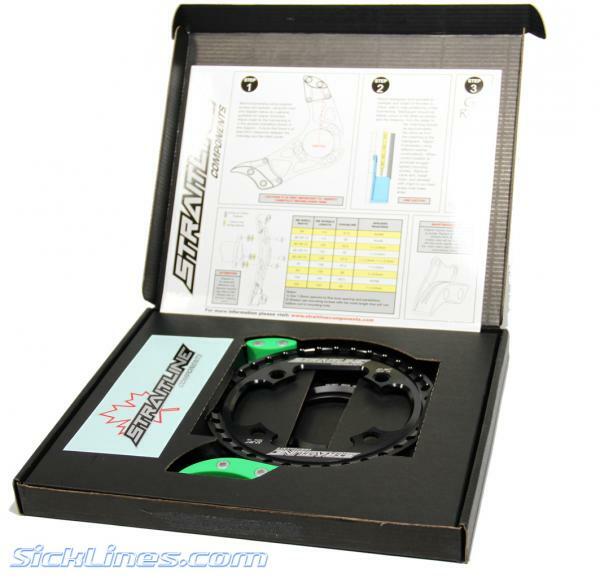 This makes installation simple and easy to customize to fit your bikes drivetrain. 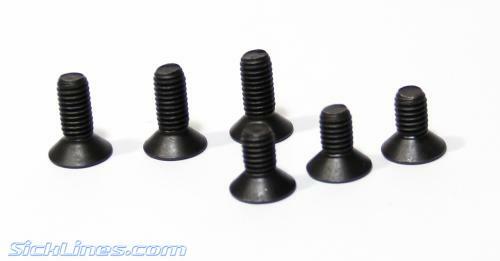 The plastic spacers are bit lighter than the typical metallic option. They're made out of re-enforced PA-Polyamide. Installation of the Silent Guide is pretty straight forward. 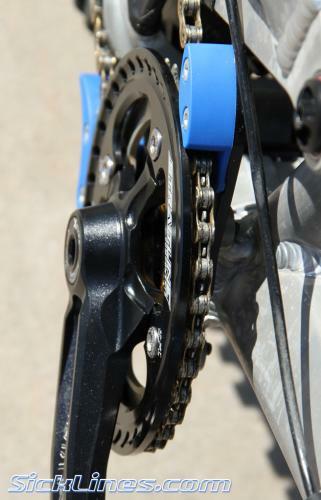 Straitline includes all of the hardware needed except for chainring bolts . 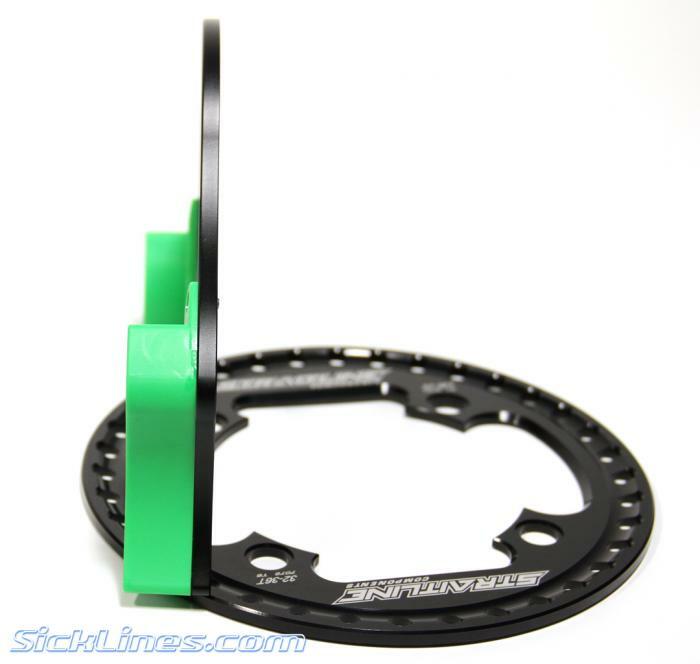 With the various width backplate spacers and 2 different sizes of ISCG bolts the Silent Guide is easy to fit correctly to almost any bike and drivetrain. Straitline followed in e.thriteen's footsteps with a simple to read and understand instruction sheet . 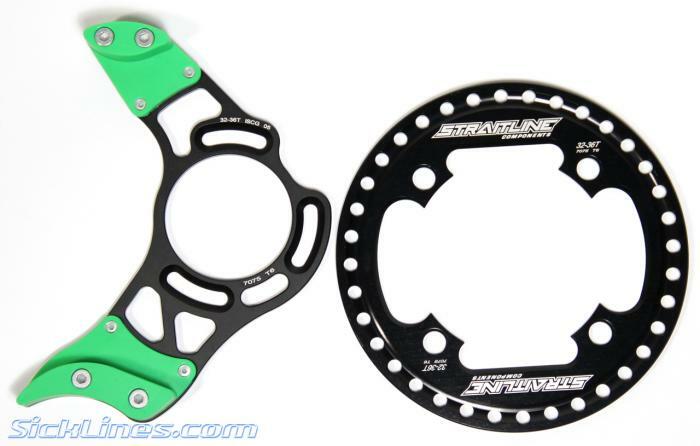 If you've got the new Saint cranks, contact Straitline to double check with for compatibility as Shimano uses a wider spaced chainring tab on the new M810/m815 Saint cranks.